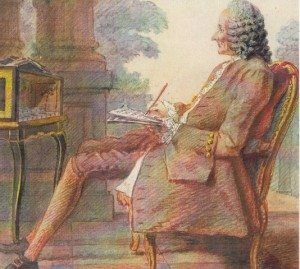 The year 2014 marks the 250th anniversary of Jean-Philippe Rameau’s death, and celebrations of the composer and music theorist’s life are taking place in France and around the world. 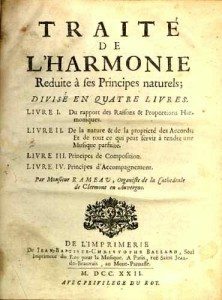 A colleague of philosophers including Voltaire, Rousseau, Diderot, and d’Alembert, Rameau established methods for discussing music theory that still influence music teachers and students today. While many know and perform his keyboard music, he was especially well known in his own time for his operas—rich, inventive, and sometimes controversial compositions that celebrated the courtly world of Louis XV. (On hearing his first opera, a competitor complained, “There’s enough music here for ten operas!”) In recent decades, his operas have again entered the repertory through performances and recordings by William Christie’s Les Arts Florissants and Marc Minkowski’s Les Musiciens du Louvre. During the 2014-2015 academic year, the University of Wisconsin-Madison School of Music—together with the Madison Bach Musicians, the Department of French and Italian, the Department of Art History, la Maison française, and the Department of Continuing Studies—will join the celebration with a series of public events, consisting of performances and panel discussions. Performers and scholars from across campus will gather to describe Rameau’s world, his ideas, the works of philosophers and artists he interacted with, and to demonstrate the scientific discoveries that informed his music theories. It will provide a unique opportunity to learn about this period, as well as one of its most fascinating musicians. The series will culminate in a performance of Rameau’s one-act opera, Pygmalion, along with excerpts from his other operas, by the Madison Bach Musicians (April 17 and 19, 2015). UW-Madison musicologist Charles Dill, a Rameau specialist, is primary organizer and contact for this festival. Read a Q&A with Charles Dill here. November 13, 2014, 8 p.m.
Music of the mid-eighteenth century can strike modern audiences as stilted or dispassionate, but composers of the time, like society at large, thought about the passions a great deal—how to describe them, what their physical properties were, and how to depict them on stage for the benefit of audiences. David Ronis, a stage director who has specialized in Baroque staging practices, and Anne Vila, a scholar specializing in eighteenth-century theories of the emotions, will discuss passion in the thought of Rameau’s contemporaries, suggesting cues for listening to Rameau’s music. The evening will include a performance of Rameau’s cantata Les Amants trahis by Paul Rowe, Chelsie Propst, John Chappell Stowe, and Eric Miller. An All-French program featuring Prof. Marc Vallon and many others. Click here for the program. Thursday, December 4, 2014, 7:00 p.m. While performances of Rameau’s music waned in the years following the Revolution, it never left the repertory completely. In the years following the Franco-Prussian War (1870-1871), French artists like Saint-Saëns, Debussy, and Fauré were eager to demonstrate that France, like Germany, possessed a rich and lively musical tradition. They turned to Rameau, with Saint-Saëns overseeing a lavish critical edition of his works. Music historians Susan Cook, Allison Bloom, and Erin Brooks will discuss France’s renewed interest in Rameau and Baroque opera, while art historian Michael Jay McClure will talk about renewed fascination with visual arts from the earlier period. Chelsie Propst and Jennifer Hedstrom will perform mélodie repertory from the turn of the twentieth century. Thursday, February 5, 2015, 7:00 p.m.
Rameau’s one-act opera Pygmalion (1748), a retelling of Ovid’s story about the sculptor who fell in love with a statue, was one of his most popular works. By 1781, it had been staged at the Paris Opéra and at court more than 200 times. In preparation for the April 2015 performance of the opera by the Madison Bach Musicians, music theorist Brian Hyer will discuss the music Rameau composed for it, and art historian Jill Casid will describe the role of Ovid’s metamorphic machinery in Baroque culture. The evening will include an account by music historian Jeanne Swack of the composer Telemann’s encounters with Rameau’s music, and John Chappell Stowe and Edith Hines will perform instrumental music by Rameau. Wednesday, March 11, 2015, 7:00 p.m.
Rameau’s contributions as a music theorist of music still influence modern discussions of tonality, harmony, and harmonic progressions. Chemist Rod Schreiner will demonstrate the principles of string vibration and sound propagation that influenced Rameau, and music theorist Lee Blasius will explain how Rameau used these principles to construct a comprehensive view of music. John Chappell Stowe will discuss how Rameau’s observations led him to investigate new tuning systems, including the now commonly used equal temperament. Saturday, April 18, 2015, 6:00 p.m.
Marc Vallon and Trevor Stephenson will host a demonstration of early music practices and period instruments, featuring performers from the Madison Bach Musicians.